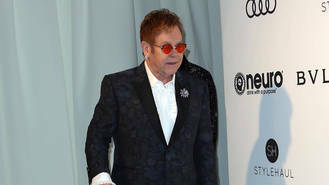 Elton John has been hospitalised with an illness that has forced him to scrap a series of Las Vegas shows. Reports suggested the Rocket Man singer was battling poor health following a recent medical procedure and needed time to rest up, but now it appears the situation is much worse. His entire April and May (17) run of The Million Dollar Piano shows at the Colosseum at Caesars Palace in Sin City has been cancelled, together with a planned 6 May (17) gig in Bakersfield, California. A spokesman for the ailing rocker tells Variety Elton became "violently ill" after contracting a rare "potentially deadly" bacterial infection during his recent South American tour, and he was admitted to a hospital upon his return from Santiago, Chile last week (ends21Apr17), where he spent two days in intensive care. He was released from the hospital on Saturday, and is now "comfortably resting at home per doctor's advice", according to the representative, who insists he is expected to make a full recovery. "I am so fortunate to have the most incredible and loyal fans and apologise for disappointing them," a statement released by Elton on Monday (24Apr17) reads. "I am extremely grateful to the medical team for their excellence in looking after me so well." Elton's previously scheduled Las Vegas shows on 28 & 29 April, 1, 4 & 5 May (17) have all been scrapped. He will return to the stage in England on 3 June (17), after taking a month off. His release from the hospital came on the 10th Record Store Day, when he was feted as the annual event's first ever Legend. Elton marked the occasion by re-releasing his 1971 live album, 17.11.70, with added tracks. The exclusive Record Store Day edition of 17.11.70+ included six new songs, including a version of Amoreena, which had never been released on vinyl. The album also features live versions of Take Me to the Pilot, Your Song, I Need You To Turn To, and My Father's Gun. Radiohead are being urged to cancel their upcoming gig in Israel as part of an ongoing cultural boycott. Mel B's estranged husband Stephen Belafonte has been granted visitation with their biological daughter. Justin Bieber has shared his mugshot from his 2014 arrest on Instagram to reflect on far he has come since then. Beyonce posted a sweet video to social media, showing off her blossoming baby bump. 80s pop trio Bananarama have announced plans of comeback. Liam Payne's ex Sophia Smith has congratulated him on welcoming a baby with girlfriend Cheryl. Model Jordan Ozuna has denied reports she is dating rapper Tyga following his split from Kylie Jenner. Sheryl Crow has vowed never to stay away from her kids for too long again after relentlessly promoting her last album. Charlie Puth isn't a fan of social media, insisting too many people "rely on it for self-approval".